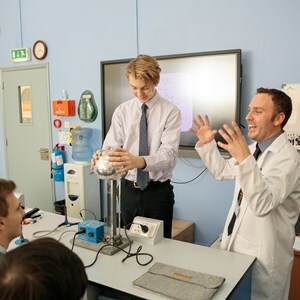 It has to be said that spring term has been extremely busy in school and full of excellent learning opportunities for our children. 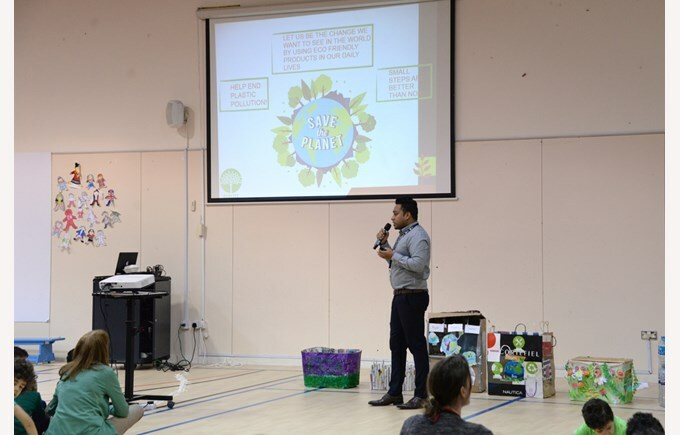 Last week was no exception with the Eco Fair which raised the profile of eco awareness in school and allowed our students to focus on ways in which we can all help the environment not only for a day, but in the longer term. 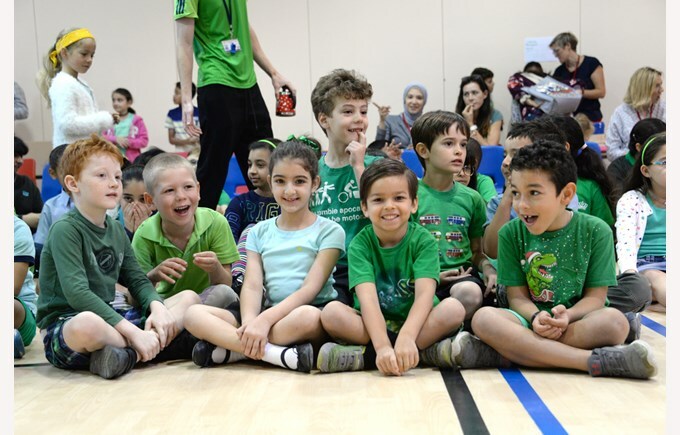 Rayyan was awash with a green glow of excitement. Eco Day had arrived! 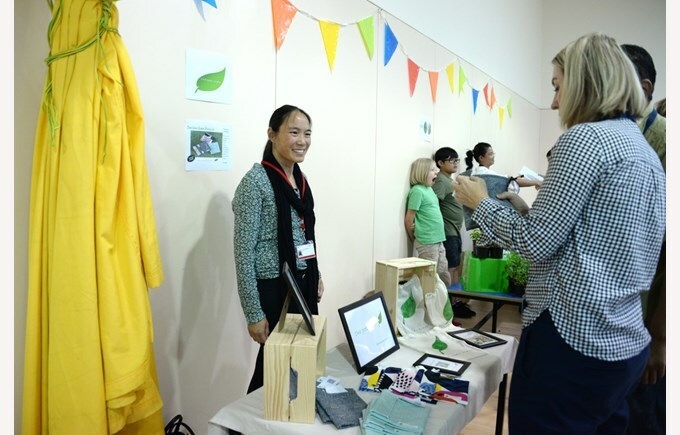 Children and Staff were joined by many parents who came to see the Eco friendly companies and businesses present their products and find out how they were made. Eco Souk, Eco Life, Dawar, One Goes Green, as well as parent sellers Julia Du Poumeyrol from Rayyan and Sze Wah Wan from Gharaffa all participated and presented information on their products. They were joined by our own Student Voice team who had worked so hard to make toys and products from recyclable materials which they sold and reinvested in the Eco Companies products to buy prizes. The student’s awareness was shown in the No Power Hour, where classes were conducted using no electricity, as well as not using any paper or plastic during the whole day. 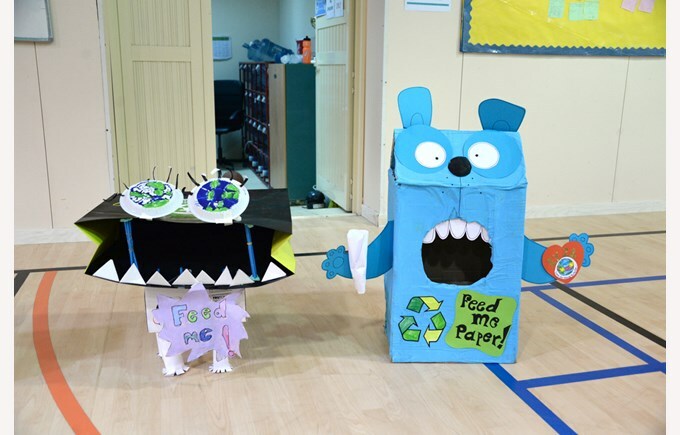 Each class designed and made an eco-friendly recycling bin out of recycled materials to make sure that they recycle in class. The winners of the competition were 5b, Early Years 1a and 4a. Each week the Eco Warriors will empty these bins into our new Paper Recycling Crate in the car park, supplied by Elite Recycling. 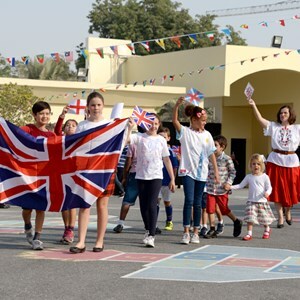 Not only were the stalls a huge success; the companies commented on the children’s fantastic behaviour, but their awareness of the Global Issues facing their generation, and their willingness to make a change. Overall a huge success. Thank you to everyone involved, we certainly believed to achieve! 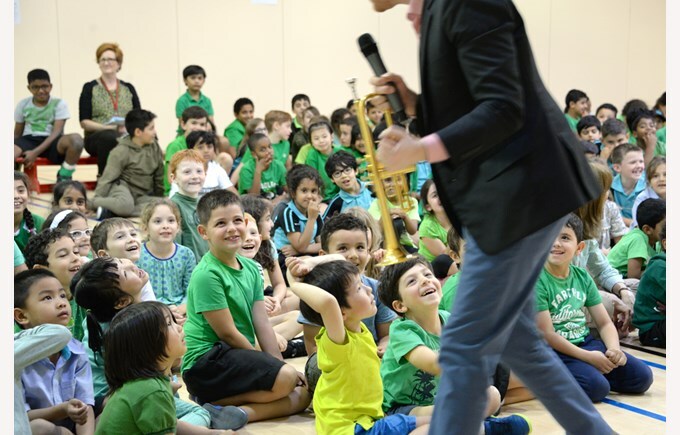 On the same day, students were treated to a masterclass and assembly without electricity in the form of wind power, when our visiting Julliard specialist, Liam Day, performed a short repertoire to each class. 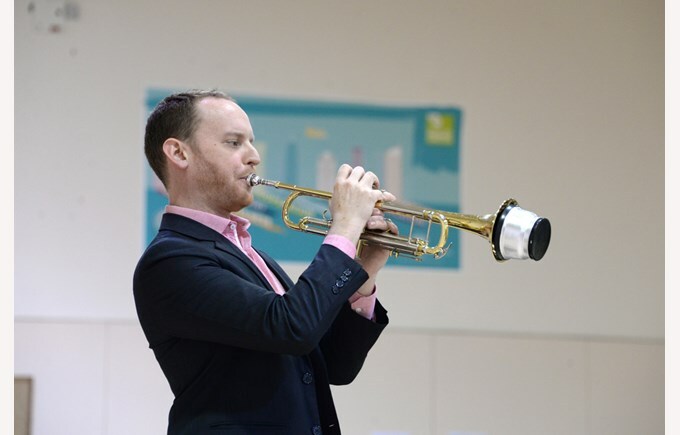 Liam is a trumpeter, Julliard Alumni and curriculum specialist. 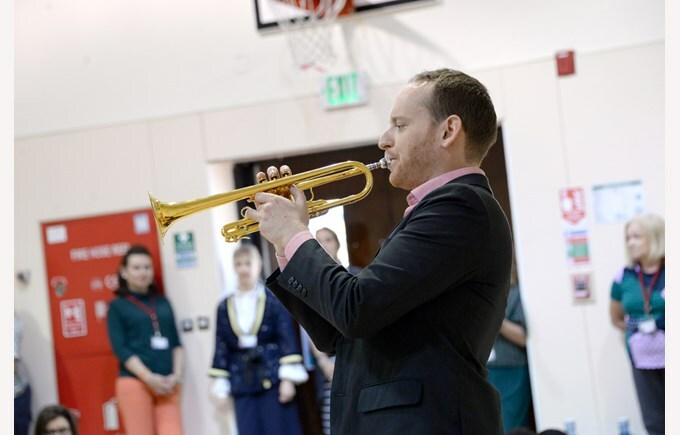 These visits are a powerful part of our collaboration with The Juilliard School. Over the last two years, our school has seen an amazing range of performing arts specialists, each bringing their own creativity and experiences to our school. 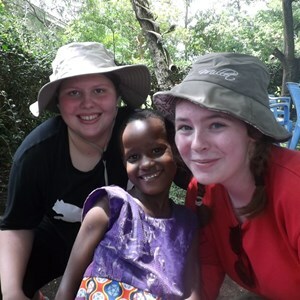 The time they spend with our students is unique and very special. 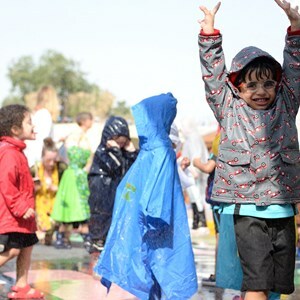 It’s the magic from these moments that inspires our students’ creativity and imagination. Our Parent Seminar series continued this week with a presentation by Mrs McKelvie on Early Years learning through play with a focus on phonics. It was lovely to see so many parents attend to find out about this very important stage in language acquisition and pre reading skills. 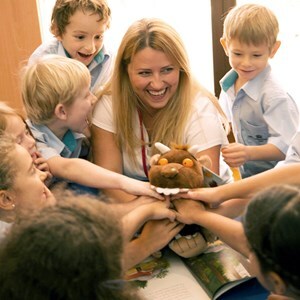 We use the synthetic phonics programme called Letters and Sounds to teach children the 42 sounds in the English language. If you would like to practice at home, more information and resources can be found here. Thank you to Mrs McKelvie for leading this very informative seminar. Last week we were busy with the final QPPSSA tournaments before the swimming galas. We had the Year 3 and 4 boys’ basketball tournament on Sunday and the Year 6 girls’ basketball tournament on Wednesday. During our PE lessons in term 1, a significant part of the curriculum is spent on basketball and invasion games. The Year 3 boys’ team showed an outstanding performance during the tournament and managed to win first place, proudly coming back to school wearing their gold medals. The team was: Luis De La Maza, Jesus Matos, Asser Mayhoub, Scott Holland- Flynn, Karim Morsy, Malek Elsewihli, Subhi Hamed. Although the focus for the Year 6 girls this year has been netball, we treated the girls to the final QPPSSA basketball tournament to mark the end of their time here at Rayyan. The girls quickly remembered the skills they learnt in younger years, and showed amazing determination placing 2nd in the group stage. This meant they reached the semi-finals. We were so proud of them. Losing in the semi-final saw us compete against Compass Gharaffa for a Bronze place position. Not even a full basket could separate the teams and we lost by a mere point in the end. The girls were so disappointed but were also very happy for Gharaffa. They were certainly ambitious on the day placing an overall 4th which was an excellent finish the Year 6 tournaments this year. The team was: Jood Hamed, Zaira Diaz Munoz, Haya Mousa, Nada Al-Rauili and Fladina Ghaisani. During the last week of term, Year 5 and 6 will be participating in Global Money Week. Global Money Week (www.globalmoneyweek.org) is organized every March in over 150 countries worldwide with the aim to educate children and youth about the value of money, spending it wisely and saving it for the future. Ever since it was launched in 2010 by Her Majesty Queen Máxima of the Kingdom of the Netherlands, Money Week has grown into a global annual event supporting the financial literacy of millions of young people. 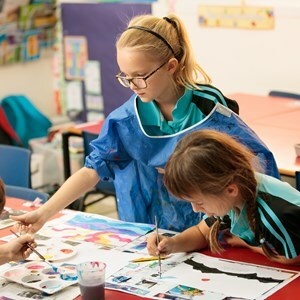 During this week, all kinds of awareness-raising activities for children are organized: guest lessons in schools, visits to banks, money museums and stock markets, and various other educational events. We will be welcoming guest speakers from the financial world into school on Tuesday and I am sure it will be an enriching experience for our students. This week we are holding a Book Fair at Rayyan Campus. Parents are welcome to come into school to browse the collection of books. Children will be given an opportunity to purchase books during class time. School Spirit Day takes place on Wednesday. We will be celebrating what makes our school special with a sports assembly, our school song and a much awaited Talent Show. Parents are welcome to attend the show at 12.30pm. Year 5B assembly led an impressive assembly on Thursday in French and In English which looked at space travel and the planets. Students learned so many facts about the possibility of life on mars and what would be needed to sustain life on mars or in a space station. The children enjoyed sharing their rap and role play of important dates in the development of space travel. Bravo-it was an excellent assembly.